The Tatra T87 was one of the great streamliners, built to cruise Europe’s first highways, a smooth, high-speed luxury express. What it was not built for is gridlocked Los Angeles traffic, something that was eminently clear as we all started to smell the car wildly overheat. This all wasn’t particularly fair to the Tatra. The T87 was a car meant for 57 degrees at 57 mph. Not 97 degrees at 2 mph. My coworker Mike and I went to see this car and its owners Paul Greenstein and Dydia DeLyser in Los Angeles because we wanted to see weird car culture, and few cars look more weird than the T87. It’s unorthodox today, sure, but it was never designed explicitly to be strange. Tatra designed this car without compromise, a very rational vision of what an automobile should be. It has an air-cooled hemi V8 mounted at the rear, giving more room to the occupants inside. It has a third headlight mounted right in its nose, giving a better view of the road. It looks like some sort of spacecraft out of Depression-era sci fi comic, but the shape was cutting edge in terms of aerodynamics for its day. What’s also alluring about the T87 is is so clearly represents almost an alternate universe. 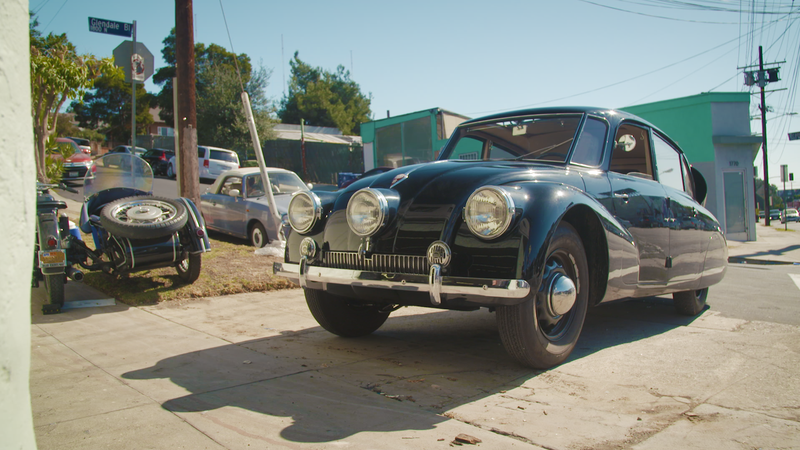 Tatra, a Czech company, got taken over by the Germans not long after they started making these cars. But here’s the thing about the Tatra — it’s like a refugee from an alternate timeline of a world that never happened. Being around a T87 makes you feel like you live in a world that split off from ours somewhere in the early ‘30s, and continued on to this utopia of gleaming, benevolent, elegant machines and avoided all of the horrors of the Depression and WWII and all that mess. All of this vision sort of started to dissipate once the drum brakes started getting hot and binding up while in stop-and-go traffic. And then the heat started to boil the fuel going into the engine, edging us towards vapor lock. And then we could start smelling the oil cooking behind us, sweet fumes making their way through the firewall behind the back seats. We made it back to Paul’s garage, technically. The brakes finally got bound up enough and the engine tired enough that the car couldn’t drive itself forward through the final intersection across from his gate. Everyone hopped out and started to push, even a complete stranger who left his car halfway blocking a lane of traffic. These are the compromises you make with an oddball old car; you’re living in a world that doesn’t quite exist. Most of the time your old car reality and the challenges of everyone else’s reality tend not to conflict, but the moments of interference are pronounced. For Paul and Dydia, who restored this car from a pile of rust they bought for eight grand, it all seems worth it. Even after the roughest ride a Tatra has seen in a long time, I can’t help but agree. Find out if you have Fusion here, and check out how to get the Watch Fusionapp on Amazon Fire TV & Stick, Roku, Chromecast, iPhone, iPad, Android Mobile, Android tablets and more. Don’t have cable? You can still catch it on Apple TV and the Sling app.